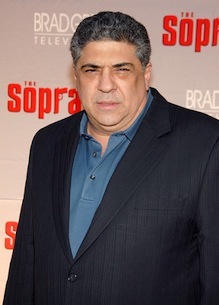 Vincent Pastore and Omarosa will tote their assets to The Celebrity Apprentice. A dozen other C-listers are also in the motley mix. Canceled by his predecessor but quickly resurrected by new NBC entertainment president Ben Silverman, The Apprentice will be back in business on Jan. 3rd with an alleged celebrity version. Host Donald Trump of course says the seventh edition of the show will be "the most exciting season yet -- maybe even better than Season One." Yawn, 14 participants will play for their favorite charity, which is the only upside. The winner gets to present a $250,000 check to his or her worthy cause. Competitors include previous Apprentice bad girl Omarosa and former Sopranos second banana Vincent Pastore, who earlier this year crapped out on ABC's Dancing with the Stars after deciding he couldn't withstand the regimen. They'll be joined by Trace Adkins, Carol Alt, Stephen Baldwin, Nadia Comaneci, Tiffany Fallon, Jennie Finch, Nely Galan, Marilu Henner, Lennox Lewis, Piers Morgan, Tito Ortiz and Gene Simmons. Anyone who can identify each of their claims to fame is an Einstein of piffle. The celebrity edition's Thursday, 8 p.m. (central) slot signals of a breakup of NBC's comedy night. The Peacock hasn't announced yet which comedies will be relocated among a quartet of My Name Is Earl, 30 Rock, The Office and Scrubs.